As Ludwig Mies van der Rohe once said, God is in the detail. Tom Hooper's Oscar-winning film, The King's Speech, stands testimony to the profound impact that detailing can bring about on viewers' minds. The movie doesn't stop at merely being a powerful subject (it deals with a king who struggles to overcome a stammer, in an era that has just opened itself to the use of wireless communication) - it is multi-layered, as it deals with several characters, and the sub-context of the politics of the era is unmissable in the narrative. The King's Speech not only throws light on the life of King George VI, who reluctantly became the King of England in 1936, but also chronicles the extraordinary journey of how he conquered his speech impediment. The film is about the Duke of York, the second son of King George V, who has a speech problem. Making things worse is the invention of microphones and the wireless, which he requires to address people across the world. Bertie, as he is fondly called by his family, consults several speech therapists and doctors, but cannot find a way to overcome his stammer. One day, his wife Elizabeth finds an Australian speech therapist, Lionel Logue, who is infamous for his controversial and unconventional methods for curing speech defects. Bertie and Lionel strike an unlikely friendship, and slowly, Bertie seems to get better at public speaking. All hell breaks loose when Bertie's father passes away and when, naturally, Bertie's elder brother David is named King. David abdicates the throne to marry a divorced woman, and the responsibility of the throne falls on Bertie's shoulders as the threat of World War II looms large. The King's Speech is as much a chronology of historical events as it is about the unlikely friendship that a monarch strikes with a commoner. And it is precisely here that the film works for those who choose to listen to this real-life story. Tom Hooper adopts a no-frills approach to storytelling, and lets his characters do the talking - or the lack of it. Some of the best scenes in the film involve Bertie struggling to overcome his stammer and his own fears of becoming a king without a voice. Cinematographer Danny Cohen and Tariq Anwar, the editor, do a fine job in both recreating the era and mood of the story. Colin Firth is brilliant in his role as Bertie. He enunciates through his eyes the fear and discomfort of public speaking - and more than that, the torment of the fact that that the King cannot speak properly to his own people. It's tough to imagine the ordeal George VI must have gone through, but Colin Firth's sublime performance does give us an idea of the enormity of the situation. Geoffrey Rush helps Lionel Logue personify perseverance. Logue's conversations with Bertie form the crux of this poignant drama, and David Seidler does a remarkable job in writing a witty screenplay. 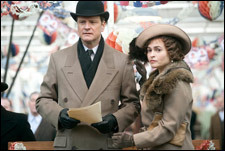 Helena Bonham Carter makes a good impression as Elizabeth who supports her husband during his agony and fear of revealing his vulnerable side to the public. Go watch it. It's not mind-blowing stuff, but you might just find yourself vouching for the King and his perfect speech without stammering. The FB 'likes' are for the fullhyderabad facebook page http://www.facebook.com/fullhyderabad, not for individual review. fullhyd.com has 700,000+ monthly visits. Tell Hyderabad what you feel about The King's Speech!